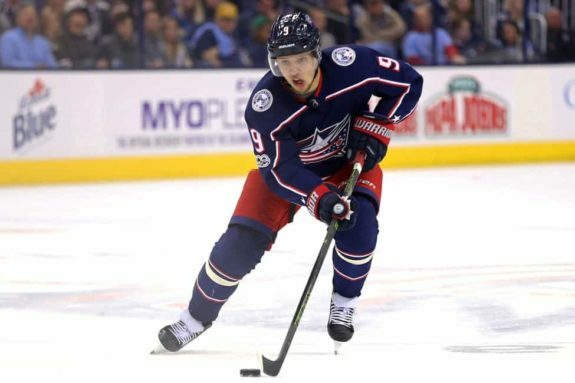 COLUMBUS, Ohio — Artemi Panarin scored twice, Sergei Bobrovsky stopped 29 shots and the Columbus Blue Jackets beat the Los Angeles Kings 4-1 on Thursday night. Lukas Sedlak and Josh Anderson also scored and Cam Atkinson had assists on both Panarin goals as the Blue Jackets snapped a two-game losing streak and held on to second place in the Metropolitan Division, three points behind Washington. Related THW Content – Blue Jackets: Contender or Pretender? Dustin Brown had the lone goal and Jonathan Quick had 37 saves for the injury-ravaged Kings, who have lost three in a row and seven of their last nine while slipping to the bottom of the Pacific Division. The Kings jumped out to a lead thanks to Brown’s tap-in goal 3:54 into the game, but they couldn’t hold it. Sedlak answered two minutes later with his first goal of the season and first in 53 games. He got a nice feed from Oliver Bjorkstrand at the goal line and poked it past Quick. Halfway through the first, Panarin snapped a shot over the goalie’s shoulder from just inside the left circle to break a personal five-game scoring drought and give Columbus a 2-1 lead. Panarin connected again late in the second period, on a power play. He was in the right place at the right time to finish when a hard one-timer from Seth Jones was blocked but bounded right out to him in the left circle. Jones got his 200th career NHL point with the assist. Anderson scored 20 seconds later from almost the same spot to make it 4-1 Columbus, and both teams played a scoreless third period. NOTES: Columbus D David Savard got his 100th career NHL point with an assist on Anderson’s goal. … L.A. D Drew Doughty extended his franchise record consecutive games streak to 361. … Kings D Dion Phaneuf suffered an upper-body injury against Buffalo on Tuesday and flew back to Los Angeles for evaluation. … The Kings recalled D Daniel Brickley from Ontario on Wednesday when D Alec Martinez was placed on injured reserve, retroactive to Dec. 8. … Sedlak was back in the Columbus lineup after being scratched the last two games. Anthony Duclair was scratched instead. Los Angeles: At Pittsburgh on Saturday. Columbus: Hosts Anaheim on Saturday.